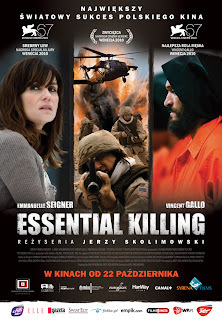 In many ways, Polish director Jerzy Skolimowski's ESSENTIAL KILLING is a straight forward action/adventure film. It concerns a soldier (Vincent Gallo) who is captured, tortured, and transported to an unnamed country for further interrogation. While in transit, an accident occurs and the soldier escapes. The rest of the movie concerns his efforts to evade his pursuers and survive in an unfamiliar land. The twist is that the protagonist we're asked to identify with is an Arab who has been fighting against (and killing) American soldiers. There is almost no dialogue in the film, and what little there is frankly doesn't matter. Gallo doesn't utter a single word, and the only other character to get more than a few seconds of screen time is a deaf mute (Emmanuelle Seigner). No countries are specified, no characters are named. All we need to know is in the visuals that Skolimowski shows us. Skolimoski's style very much reminds me of films from the sixties and early seventies, which is when the director got his start. One can easily imagine this film having been made back then using the Viet Nam war as a backdrop with someone like Peter Fonda or Warren Oates as an American POW escaping from the Viet Cong with very few changes. I'm sure if this film were a little more high profile, the Glenn Becks and Rush Limbaughs of the world would be railing against it as anti-American. As usual, they would be wrong. ESSENTIAL KILLING does not portray its protagonist as heroic. Gallo's soldier has his reasons for fighting, which we see in dreams, flashbacks, and hallucinations, but the film regards both him and his pursuers with neutrality. This is not a political film, but rather a film about the lengths to which one man will go in order to survive. 3 1/2 out of 4 stars.